One Duke men’s basketball walk-on will spend his summer biking across the country. Brennan Besser, who walked onto Duke’s Basketball team, is biking across the country this summer for charity. He plans to ride, walk and run from Seattle to New York over 70 days to raise awareness and funds for his charitable foundation, Walk On America Foundation. The foundation supports charities that help the intellectual and developmental disability community. Starting today, May 16, Besser will travel more than 3,400 miles across the United States. At most stops along the way he hopes to hold basketball clinics or other events, hoping to raise $1 million for the foundation. 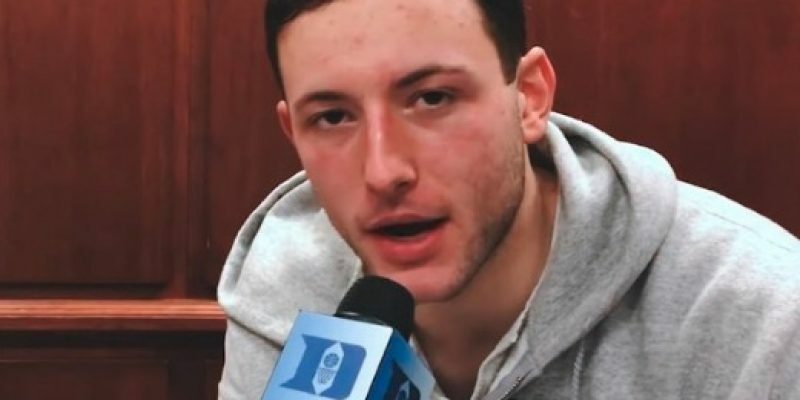 Duke’s Men’s Basketball coach, Mike Krzyzewski, described Besser to the Associated Press as a “one-of-a-kind walk-on” because “the spirit he brings is infectious on this team. Nothing he does surprises me, because almost everything he does is not about him. Besser shares that he’s motivated to help others primarily because of his older sister Jacqueline, who nonverbal with impaired motor skills. Age 23, she communicates mostly by using a tablet computer. “There are millions of lessons that she’s taught me, but it’s those big things like, how do you deal with adversity?” Besser told the Associated Press. He plans to travel 60 miles a day—and on some days bike up to six hours. He will be traveling with a team of 3 to 5 people, including a medical professional. Former and future Duke players are anticipated to help with the basketball clinics. When he gets to Minnesota, Timberwolves players Amile Jefferson and Tyus Jones and Jones’ younger brother Tre, a rising Duke freshman, are anticipated to help with a clinic. Grayson Allen will participate with him at a New York event.